Exclusive to IHG® Rewards Club members. Earn Faster with this package offer – Earn 1,000 bonus IHG Rewards Club points for each night when you book the 1,000 Bonus Point Package. 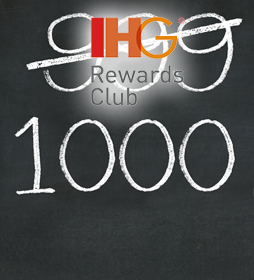 Membership in IHG Rewards Club is free! Points can be redeemed at any time for a variety of rewards, including free hotel stays starting at just 10,000 points, airline miles, name-brand merchandise and more. Book now to take advantage of this special offer! Terms and ConditionsOffer is subject to availability. No expiration date. Not valid for group bookings. May not be combined with another offer or promotion. Rate is per night for single or double occupancy and includes 1,000 IHG® Rewards Club points per night. Offer is refundable. No deposit is required. Offer is neither retroactive nor applicable to existing reservations.